With winter giving way to spring and summer (or so we hope!) it’s time to reassess your skincare regimen. Likely you’ve been using a heavier moisturizer during the dry winter months, but it might begin to feel too rich. Also, as we age, our skincare needs change so it’s always a good idea to reassess our skincare routines every so often. 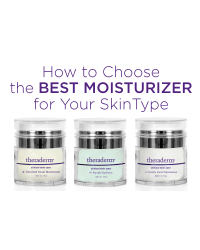 Here are some tips for choosing the best moisturizer for your skin type. Look for a heavier oil-based moisturizer such as our Enriched Facial Moisturizer. which uses the highest grade of cosmetic lanolin to soften and smooth skin, replenishing natural moisture and restoring softness and suppleness to the skin. Also, if you’re over 35, consider introducing an eye cream to your skin care regimen. Check out our Peptide Repair Eye Creme! Most of us have normal or combination skin. The Theraderm Peptide Hydrator is ideal for normal, combination or oil-prone skin because it is infused with patented keratin peptides and micronutrients that restore damaged skin cells while hydrating and softening. It uses extracts from cucumber, green tea leaf, grape seed, and chamomile flower to calm and soothe skin inflammation while providing micronutrients for healthy skin.This facial moisturizer provides an optimal skin surface for flawless makeup application. If you have sensitive skin, you want a lightweight moisturizer that is non-comedogenic and made without parabens, dyes or fragrances such as the Theraderm Gentle Facial Moisturizer. This water-based moisturizer won’t clog your pores, and works great with sensitive, allergy-prone or reactive skin. If you struggle with acne, you might want to check out the Reversion Acne Control line. Once you find the perfect moisturizer for your skin, it is important to use it regularly — morning and night, for best results. And don’t forget to exfoliate!